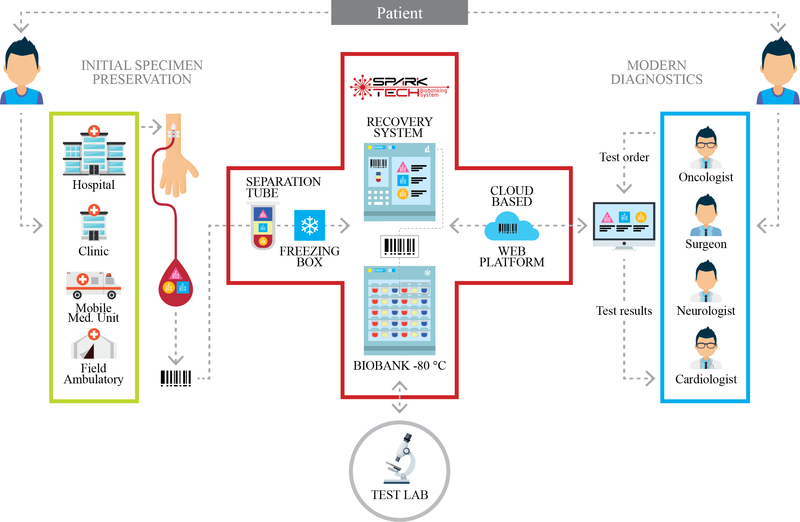 Spark Tube Biobanking System (STBS) is to be the first commercially available automated system for separation, preservation and biobanking of human blood. Major advantages of the system are high-throughput sample processing, cost-effective design, environmentally friendlily product combined with fully operated hands-off processes. Major markets for STBS include: safety and efficacy monitoring for public health and pharmaceutical industry; secondly, medical diagnostic biomarkers for cancer, neurodegeneration, cardiovascular diseases; thirdly, epidemic outbreak and rare diseases treatment for WHO and military (Ebola, Zika viruses). Spark Separation Tube which is expected to enter market in 2020 is the first element of STBS. Thanks to its’ innovative and patent pending construction, it allows for automated highly repetitive and accurate process of layering liquids by creating sharp interphase between them. Automatization enables blood separation to fractions high-throughput, highly repetitive, easy-to-handle and human error free.